Over at the Main Line I posted about a beautiful book called Pantographia; containing accurate copies of all the known alphabets in the world; together with an English explanation of the peculiar force or power of each letter (by Edmund Fry, London, 1799). Great examples of many different kinds of alphabets included, with sources given. 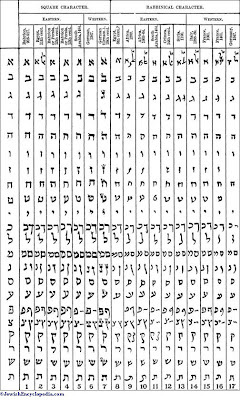 In addition, the Lord's Prayer is presented in each alphabet (and language) along with English transliteration. It is the nature of the beast that such a work would include lots of examples which look a little bit strange to the modern eye that has seen many of the actual scripts, as opposed to Western renderings of them (see, e.g.). The source given for this example is Claude Duret, which is to say it is from a 16th century book. 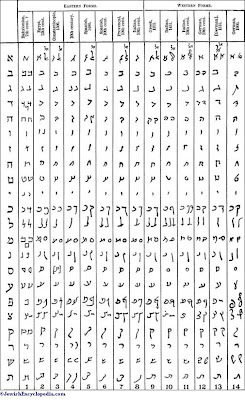 "The alphabet of Rabbinical Hebrew, of which there are three sizes at the Type-Street Foundery." * I know; don't hassle me. Mashait, blah blah.